Housed within Sheraton Imperial Kuala Lumpur, Celestial Court offers delicious Cantonese cuisine prepared with a variety of cooking methods ranging from steaming and poaching to baking and stir-frying. The a la carte menu boasts of delectable bite-sized dim sum as well as the freshest seafood. Chinese Restaurant Chef Ho Boon and Dim Sum Chef Ken cook up a storm to satisfy taste buds. Whether it is the simplest of Cantonese cuisine using a harmony of ingredients and the freshest produce or gourmet Cantonese delights, guests are assured of a completely divine meal from start to finish. We absolutely adored Celestial Court's Dim Sum. Delicately prepared and wonderfully scrumptious, each was a flavour explosion. The steamed mini abalone siew mai was of particular note. A juicy mixture of chicken and fresh prawn meat was encased in paper thin wanton skins and topped with mini abalone and roe. An absolute must-have is Celestial Court's Cantonese Roast Duck. It only takes one bite to understand why it has become one of the restaurant’s signature dishes. Simply put, the dish is all about the duck’s thin crispy skin. The tender duck meat, although delicious, plays an ancillary role in this affair with the moreish duck skin taking centre stage with its beautiful flavour. Along with home made sauces, this dish is sensational and a definite must try. The Deep-fried Prawn with Salted Egg Yolk is similarly delicious and was a testament to the chef’s skills. Think prawns encased in light and crispy tempura batter and laced with feather light egg yolk floss and aromatic curry leaves. For the sweet tooth, do not go past the bowl of traditional hot almond cream with black sesame glutinous rice ball or the durian butter cake (strictly for durian lovers only). 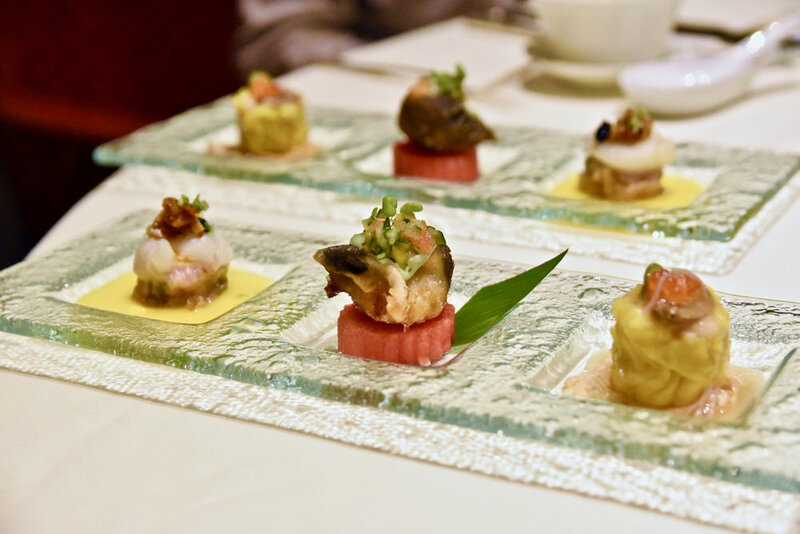 Whether it's for a leisurely “Dim Sum Brunch” on a weekend or a decadent Cantonese dinner to impress, Celestial Court has you covered with their talented chefs showcasing a seemingly infinite selection of the best of the Cantonese tradition.